Look at this super cool Bungee Run with the Interactive Play System! Get competitive with this awesome Bungee Run and try to tap as many of your lights as you can. 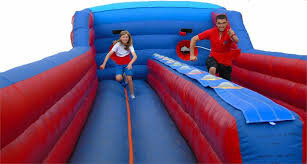 This inflatable will challenge your hand-eye coordination, endurance and strength. It's more challenging than it looks! With this game you have 3 competitors: the bungee-cord, the time and of course your opponent! Highly addictive!